The first week of our final split has just come round and competition is vicious for those championship points. Here’s a rundown of what happened. The Aston Aunties remain in top spot while Grey Warwick beat University of Birmingham TCA Storm in a top of the table clash to book their place in the top two. As a result it is the team from the University of Birmingham that misses out on automatic qualification. The Cambridge Memers have climbed up to 4th while Huddersfield White drop to 7th. The UKC Kittens put in a strong showing climbing three places into 6th while the Loughborough Titans come out of nowhere to jump into 5th at the expense of the USW Dragons who fall to 8th. Star Hull Royal Club ended PJ Saltford’s rule at the top of the table by jumping into 1st place from 6th. Meanwhile, there seems to have been a rising in Glasgow as both the Glasgow Titans and GU Tigers surge up the rankings. The GSoC Nerds and MMU Popolinos have risen to 4th and 5th. Team Derby Knights continue to top the Midlands League still followed closely by UoB Tempest. Sheffield 5 and Staffs Last Resort remain in hot pursuit while Lincoln’s Last Knights leapfrog Team Aston into 5th. The GangBangors top the table this week despite a slightly poorer showing. The Bathkok Titans and Bristol A Team were beaten by Team Swansong and Monarch in the battle for promotion seedings. Genrully Better move up from 8th to 3rd while Sirens of the Beach lie in 5th. 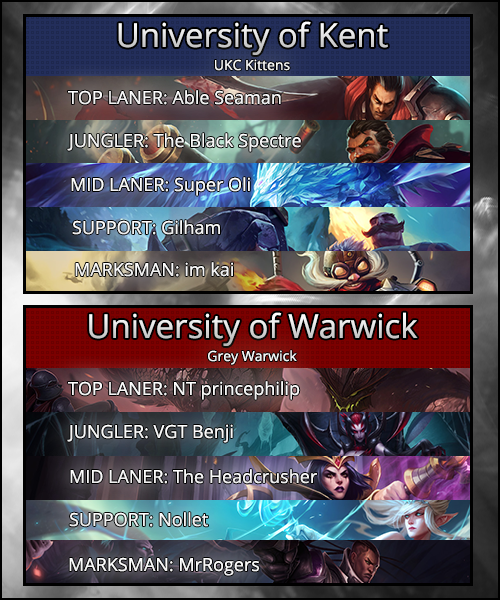 UCL Genesis now top the league on their own as Urf Warwick and Firefang Warwick battle to prove who is the one Warwick to rule them all. The UKC Red Pandas remain in 4th while KW116 join the pack in 5th. S6 eBlades finish off the top six. Our featured match saw the UKC Kittens up against Grey Warwick as they competed for a place in next week’s National League final. So keen were these teams to make an impression that the action started at level one as an invade from the Kittens forced Grey Warwick out of their jungle and a flash out of Nollett’s Janna. However, the Kittens could not find a way to exploit this admittedly small advantage and it was Grey Warwick that came out of the early game ahead. By twelve minutes, it was five kills to one with a 2.2k gold lead in favour of Warwick, princephilip on Malphite having made the most of Able Seaman’s early aggression on Darius and BenJi on Elise able to make use of the champion’s early pressure. Further ganks from BenJi helped to snowball Warwick into the midgame. Things were not going the Kittens’ way and a dive in the bottom lane from Warwick seemed to prove this. Now 10-2 down and 6.5k down the game was running away from them. As a result, they took a more defensive mindset, grouping up to prevent the picks that BenJi had been orchestrating since the early game. Able to catch out lone members of Grey Warwick warding, they were able to claw back at least 3k gold by eighteen minutes to resuscitate their chances of progressing. Warwick realised they needed to take a moment to step back, regroup and push their advantage, culminating in a siege of the bottom lane inner turret. After a pick onto Super Oli’s Anivia. With much of their opponent’s waveclear gone they felt comfortable pushing for the turret. The Kittens defended like lions, but it was Warwick who emerged victorious from the fight, picking up three kills as well as the turret, all escaping on slithers of health. The Kittens refused to roll over despite the best efforts of Warwick. They managed to set up their first siege of the game on the middle inhibitor turret showing just how far they’d managed to claw their way back. Yet this played straight into Warwick’s hands as, despite the Kittens backing off, Gilham’s Braum was caught on the way out, start a fight which the team from Kent didn’t want. While Able Seaman’s Darius managed to tank a huge amount of damage from the Grey Warwick backline, it was his team’s carries that were taking the punishment. Feline after feline fell as the Kittens were aced. Despite the determination of the UKC Kittens, Warwick were victorious. Here we have the wise words of caster extraordinaire Dezachu: “Although they’re on the losing team I will have to give it over to Super Oli. He just played so well coming into the mid and late game, there being not much I can criticise about his play at all apart from getting caught out a couple of times.” Congratulations Super Oli for earning our MVP award. The National Championship enters its final week of games this weekend before the Wildcard Tournament. Get busy folks because the best is yet come!